The volatility of silver prices last year may have masked a positive year for the precious metal. Despite hitting lows below $16 an ounce and reaching highs over $18 an ounce, silver prices still grew 6% on the year. Money Morning Resource Specialist Peter Krauth – a veteran of the precious metals market with over 20 years of experience – has made his bullish silver price prediction for 2018. Peter forecasts the price of silver will end up between $22 and $24 per ounce by the end of 2018. Those figures represent gains of 29% and 41%, respectively, from today's price of $17.02 per ounce. We'll show you exactly which catalysts will help push silver prices higher this year in just a bit. Back in 1980, silver prices entered a bear market that lasted more than a decade. Despite a recovery beginning in the mid-1990s, the price of silver is still only partially back to its previous levels. Before the 2016 rebound began, silver prices suffered for over four years. After peaking at $51.33 in April 2011, prices dropped a staggering 73.2%, to $13.76, by Dec. 14, 2015. 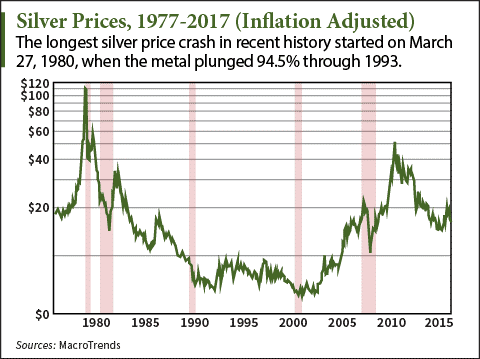 The worst crash in the history of silver prices happened on Tuesday, March 27, 1980. That was when the U.S. silver price plunged 64% in one day. It's now infamously known as "Silver Tuesday," because it was an unprecedented event in the precious metals sector. The culprits behind the silver price crash were brothers Nelson and William Hunt. The two attempted to corner the silver market by buying both physical silver and silver futures with loaned money. But they ended up defaulting on their loans, which crashed the entire silver market and started a bear market that lasted until 1993. Since the 1993 recovery, silver prices collapsed again in 2011. From peak to trough, the price of silver plummeted 70% by the end of 2015. Now, we're just starting to see the silver price bounce back, and that could make right now one of the best buying opportunities we've seen since 1993. Silver prices are already up 23% since the beginning of the recovery in 2016. And that's even with a soaring stock market, which is traditionally a drag on silver prices. The Dow Jones is up 49% during the same time period. But with stocks hitting astronomical valuations – the Shiller PE ratio is now higher than it was before the 1929 stock market crash – investors are wise to look toward safe-haven assets like silver. We're expecting the demand for silver to remain strong in 2019. Silver buyers aren't just investors looking for a hedge against risk or another profit opportunity, but they're companies that rely on silver to manufacture products. Roughly half of every year's production of silver is used by the industrial sector. And silver is essential to the tech industry. Silver is a necessary component in smartphones, computers, tablets, energy grids, solar panels, and smart vehicles, among other uses. That means as long as consumers are buying iPhones, the demand for silver will continue to grow. Plus, silver is critical to the jewelry industry. According to The Silver Institute, jewelry stores saw 17% growth in silver sales on average in 2017. Overall, 59% of stores saw increased silver sales. The age group of buyers? On average, between 20 and 40. Young people are buying and we think will continue to buy silver jewelry. That demand is evident in the silver market, too. One way to measure the demand for silver is the Sprott Physical Silver Trust ETV (NYSE Arca: PSLV). PSLV is a Canadian exchange-traded vehicle (ETV) that holds physical silver at a secure third-party location. It lets people own physical silver without the hassle of properly storing it and keeping it in good condition. Any rise in the PSLV price essentially equals a rise in silver bullion demand. PSLV has gone from $5.18 to $5.29 in just over a month. That’s positive momentum building for 2019. Many investors look at the short-term returns on investments or the silver price today to make a judgment. That’s fine, but there’s a tool we can use to look at the long-term return. The Dow/Gold Ratio. This ratio shows us where we are on the long-term economic timetable and allows better predictions on what’s going to happen in the market. Now, you might think the Dow/Gold Ratio has nothing to do with silver, but it does. In the past, when the Dow/Gold Ratio peaks, it’s a great time to buy or hold onto your silver. In the last 100 years, after every peak in the Dow/Gold Ratio, the silver price has shot to the highest prices. Since 1999, the last Dow/Gold Ratio peak, there hasn’t been a high peak in silver prices. We think it’s still on its way. Hold on to your silver so you’re ready. Because precious metals like silver hold their value over time, investors turn to them to protect their money against inflation and a weakening dollar. And as inflation is finally starting to rise again while the dollar slides, silver prices will grow. The U.S. Federal Reserve says it's targeting a Core CPI inflation rate of 2% to continue hiking interest rates, and the Fed is predicting more rate hikes in 2019. 2018 brought three rate hikes from the Fed, bringing the inflation rate to a whopping 2.4% in July. The rate has leveled off to 2.2% in Q4. Investors are still expecting more rate hikes in 2019 from the Fed. Bloomberg explains in a Jan. 18 story that the Fed's preferred inflation calculation sells the rising price of goods short. "The Fed's preferred inflation gauge does a pitiful job of capturing the quandary facing many households that live paycheck to paycheck," Danielle DiMartino Booth wrote in the Bloomberg explainer. That means real inflation could be a much higher rate than the 2% or 2.2% measure that the Fed relies on. And it's the real inflation rate that the silver price responds to. Plus, as inflation rises, the value of the dollar falls, which also boosts silver prices. The U.S. Dollar Index, which tracks the value of the dollar against other currencies, is up in 2018, but only a little and it’s barely recovered from a big dip mid-year. Peter is predicting a "longer-term downward trend" of the dollar to be maintained in 2019, even with the small rise we’ve seen this year. Since silver is primarily traded in U.S. dollars, the declining value of the dollar means silver will appear cheaper to international buyers, who will be incentivized to buy more. That boosts the silver price in the United States and abroad. FAQ No. 1: What Causes Silver Prices to Fall? There are two events that can send silver prices lower. But as Peter forecasts, the dollar's value is expected to continue its decline in 2019. Second, surging stocks weaken silver prices, because investors will move their money to where they think it will see the biggest return. While stocks have been on a tear lately, surging between the record-high 25,000 level to a new record-high 26,000 in a matter of six days, stocks are reaching historically high valuations. That means they are more expensive compared to other investments, and it could be a sign a market correction is on the way. FAQ No. 2: What Drives Silver Prices Up? Conversely, low interest rates and declining stocks push silver prices higher due to the metal's appeal as a safe haven. Precious metals like silver are considered safe havens because they'll hold their value, and even grow in price, as stocks fall. Silver prices will either move sideways or increase when the stock market dramatically dips. These hedging qualities are what make silver a strong long-term investment. FAQ No. 3: Are Silver Prices Going Up in 2019? Money Morning Resource Specialist Peter Krauth is predicting 2019 will be a bullish year for silver prices, but investors also can't afford to overlook the tailwind behind gold prices in 2019. Check out how gold prices could reach $3,000 this year….